Grandmaster Chess Game Review - Download and Play Free Version! 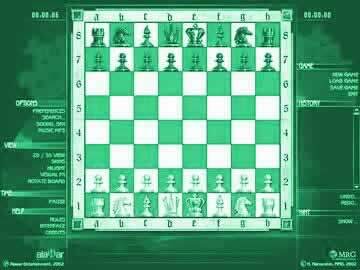 Improve Your Chess Game and Expand Your Mind With This Excellent Chess Software! Multiplayer on the same computer or on a network. Hints are helpful for beginners just learning to play. Different chess board styles so you can pick which one you like. 3D view can make it tough to see your pieces. Game is prone to crashing. Easy to learn but hard to master, chess is one of the oldest and most popular board games in the world and now you too can get in on the exciting action! With Grandmaster Chess, it's just you, your opponent, and the game board. Great for players of all ages and abilities, Grandmaster Chess does away with all the needless fluff and extra stuff included in other chess games and replaces it with a simple, intuitive interface that won't get in the way of your desire to develop your skills! Face off against challenging AI players whenever you want - no need for another human player if you don't want one. With multiple ways to adjust the computer's playing style and experience, Grandmaster Chess makes it easy to find an even match and a great game! Should you choose to use it, a sophisticated hint system shows you several possible moves at every point in the game. Tired of dominating single player games? Grab a friend and engage in a one-on-one battle for bragging rights, or even take your game online over a network - challenge those smarty pants office mates to prove their intelligence! School chess clubs can even utilize the program as part of their training or daily chess matches. Some of the Best Graphics Ever Seen in a Chess Game! The 3D perspective of Grandmaster Chess allows you to view the game board from any and all angles you want. On the other hand, if you're looking for a more old-school feel to your chess-playing experience, switch to a traditional 2D top-down format. Either way, the visuals look great! You can also mix and match cool styles of boards, pieces, and colors. Some sets feature authentic figures, such as those of antique Iranian chess, provided by Geogiy Ivanov. This is chess like it's never been seen before! Listen to Your Own Music as You Play! A new sound effects algorithm in Grandmaster Chess makes it possible for you to choose what music you want to listen to - as you play the game! Of course, the game also comes with its own music and sound effects, so everything is completely up to you. As chess software, Grandmaster Chess includes all the essential features that make for a top-notch representative of its game genre. Whether you'd like to become a better tournament player or just learn to hold your own against friends and family, you can make it happen with Grandmaster Chess. Some sets feature real figures, such as antique Iranian chess, provided be Geogiy Ivanov. Sophisticated hint system show you several possible moves to help you learn Improve Yourself and Get a Great Brain Workout at the Same Time! Grandmaster Chess provides an excellent in-depth chess experience. 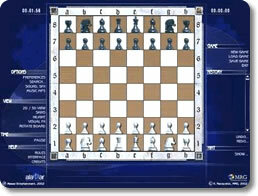 This particular chess game is geared more towards medium level chess players. A lack of difficulty settings may be too challenging for beginners and too easy for experts. The 3D pieces and board combined with the option of a 2D view make this a good game to play if you already have some chess experience and want to improve your skills. This game is played with the normal rules of chess. Hints and tips can also be turned on if you need assistance. There are hints as to which move you should make, where any particular piece can move and what pieces are in danger of being captured. 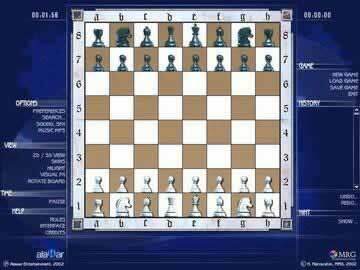 You can also adjust the appearance of the chess board and pieces. There are traditional style and pieces that have been glamored up a bit. With only one difficulty setting this game will probably be too difficult for absolute beginners. If you are willing to put in the effort and lose a large number of games it would be possible to learn enough from this game that you could compete with the computer opponent. The other option is to play the multiplayer with a friend. You can either compete on the same computer just taking turns, or you can compete over a network connection on separate computers. The graphics in this chess game are excellent. The 3D game board looks real and lets you feel like you really have a chess board in front of you. The sound also contributes to this. Each time you move a piece it sounds like you just set it down on the board. While the sound and graphics aren't top of the line they are definitely above average for the chess genre. As you can see the game has a few flaws. The orientation of the camera for the 3D board can make it difficult to see the pieces in play. The smaller pieces can be blocked by larger pieces behind them and it is also very difficult to grab them. To see the location of the pieces you can switch to a 2D board view, you will most likely spend most of your time in the 2D view. This is nice to see the pieces but it would also be nice to be able to rotate the camera. Another drawback to this game is that it is prone to crashing. Periodically during multiplayer the game will encounter errors and be shut down. This also happens occasionally during solo play. Grandmaster Chess brings all the strategic elements of chess to your computer. A lack of difficulty levels severely limits this chess game. The only real audience this game would be suited for is a mid level chess player. A few options exist to help you learn, but they are minimal. Several other chess games on the market are a much better choice over this game. Player created video showing a 3D view of the game board.